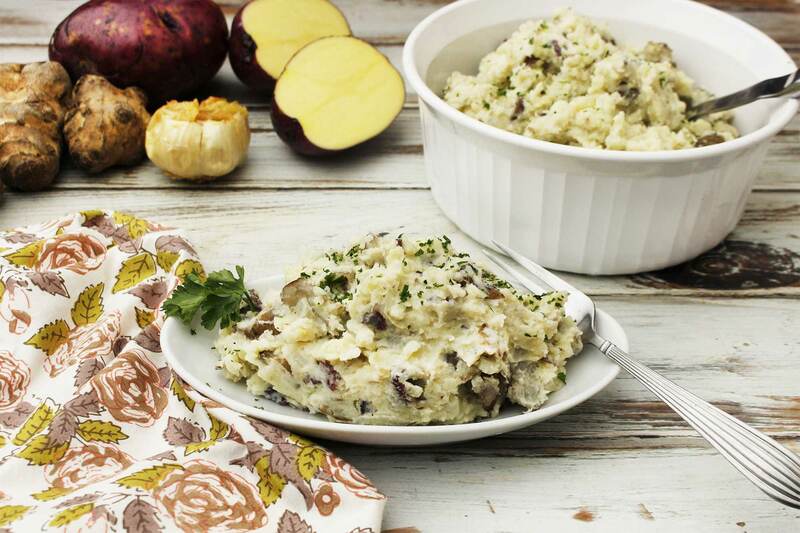 Sunchokes are a delicious addition to mashed potatoes. Cut ¼ inch off the top of the head of the garlic. Pour the olive oil over the top, then wrap with foil and place in the oven. Roast for 20-25 minutes, until the garlic is tender. Set aside. Meanwhile, fill a large pot with cold water almost ¾ way to the top and 1 tablespoon sea salt. Wash, then cut the potatoes and sunchokes into 1-inch pieces and put them into the cold water immediately. Boil the potatoes/sunchokes on medium heat, until they become tender, about 20-25 minutes. When tender, drain in a colander and rinse with hot water, then place them back into the pot. Squeeze the roasted garlic flesh (not the peel) into the potato/sunchoke mixture, add the sliced butter, cream, 2 teaspoons sea salt and pepper. With a potato smasher, smash the mixture until well combined. Season with more salt and pepper if needed. Place in a serving bowl and sprinkle with fresh minced parsley.